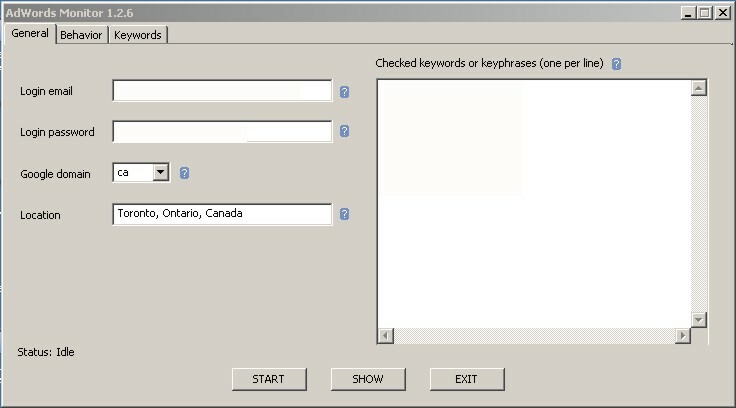 AdMonitor™as a Keyword Tracking Tool. AdMonitor™is a desktop application and service that helps businesses with medium to a large AdWords budgets. .
- Our system provides a stable top position for your AdWords results by adjusting automatically your AdWords bid prices, thus bringing you lots of new sales. - You tell us what position you need to keep for a given keyword and our system will find the minimum bid for that position. This way it saves you lots of money from your AdWords budget. 3. How many fringe keywords? Do you want to maintain certain position on Google's search results? 7. Do you feel that Google's AdWords account provides you with all the necessary information to maintain desired position at the best $ price?. 8. What is the information not provided by Google that you would like to have to make better decisions? 9. If our AdMonitor™ program can provide you with such information? 10. If you maintain AdWords account in-house, how much time do you devote daily to managing your AdWords campaigns? 11. Would you wish for a third party automated solution to help you with AdWords bidding process to maintain any desired position? 12. What information you are missing and they can help you to optimize your AdWords spending? 13. Do you feel that you are overspending with Google AdWords comparing to the revenues generated from the program?.